All mains at Rise & Grind Coffee Co. are well priced under S$20, and they occasional offer lunch deals at a steal. Expect Asian fusion food here, together with a good range of beverage and dessert options. 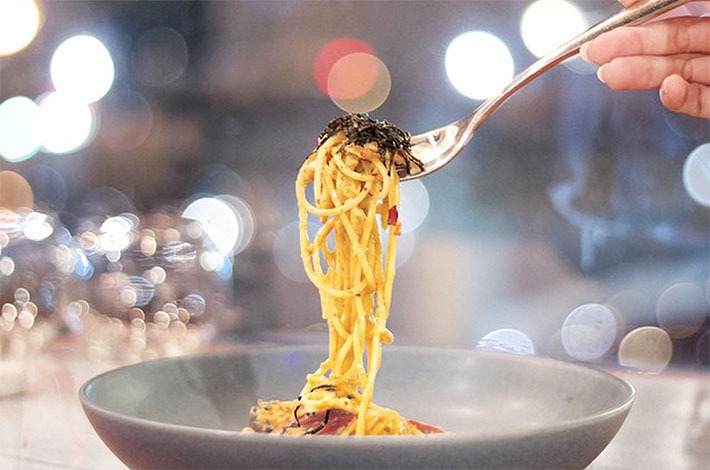 For a mere S$16, the chef at Rise & Grind will whip up this mouth-watering plate of pasta with a local Asian twist for you. Besides being perfectly al dente, each strand of pasta is coated evenly with the homemade Tom Yum sauce. Delicious chicken wings start with a crisp exterior and when bit into, will reveal cooked-through and juicy meat – and that’s exactly how the Honey Wings (S$9) at Rise & Grind Coffee Co. fared. Coated with a slightly sweet honey sauce on the outside, the skin did not turn soggy even after leaving it on the plate for awhile. Rise & Grind had perfected the Nacho Libre Burger (S$17) with a still-juicy chicken patty and a unique nacho cheese sauce with guacamole smothered on top of it. The only letdown was that the nacho chips served inside the burger itself turned soggy with the sauces. Have your dessert with their house blend coffee for ultimate contentment. I like the way you described the pasta being al dente and perfectly coated. I’ll try the place out this weekend. By the way, you might wish to consider updating the MRT to Beauty World instead. Another Fellow Foodie Reviewer who believes that good foods should be shared and that they don’t necessarily have to be pricey.